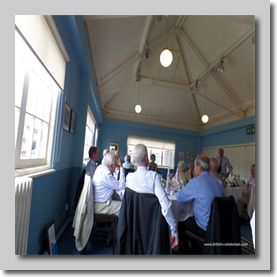 It was a most memorable occasion at a curiously strange but appropriate venue,despite the travelling difficulties encountered by anyone attending via the “Great Circular Car Park”! The dreaded M25 was snarled up to the extent that even the great man himself, was late on parade! I myself took 1 hour 45 minutes for a journey that should have been about 50 minutes and the same was true for Peter and several other attendees! 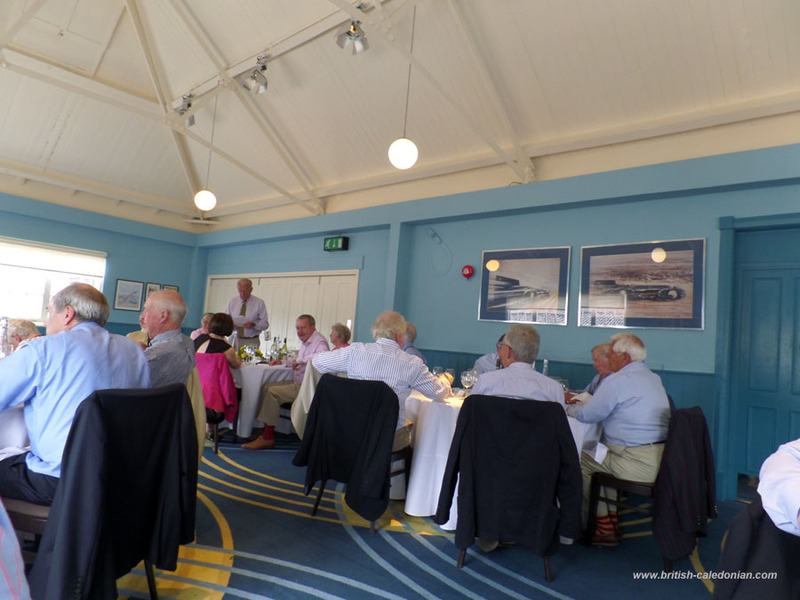 I suggested to Alastair that the Brooklands venue was chosen because it is the home for a bunch of old motor crocks, old aircraft and on this occasion a bunch of old farts! Very apposite and appropriate as it turned out! 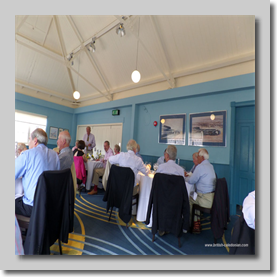 The average age, not counting Tim Williiamson, must have been close on about eighty-five and a half and my own presence at 67 and my wife’s at 52 must have seriously dented the average age!! Only joking of course! 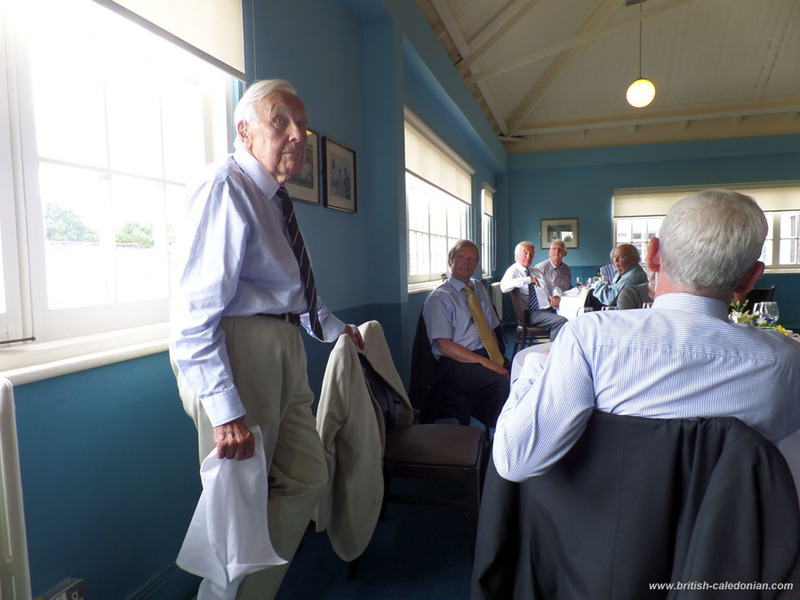 Ah well, a good time was had by all who attended and Peter gave a final address after written "in absentia" tributes were read out by former Chief Flight Engineer Tom Mormon and after erstwhile M.D., Alastair Pugh, had said his amusing and well delivered piece. 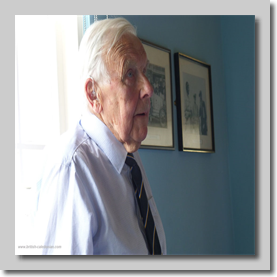 Peter will be fondly remembered and especially for his stamina in continuing until the ripe old age of 91,which is quite extraordinary. This, I suspect was at least partially due to his secretary and “Girl Friday”, the amazing and delightful Mary Ewing, who is captured here on some of the under-the-armpit photos. 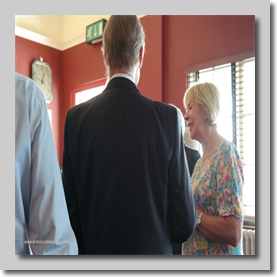 Her attention being taken on this occasion by one Timothy Williamson!! As I understand it, Mary will still be in close contact with Peter for the time being at least, since there is the small matter of shredding years of files and other documents and filing whatever is required! 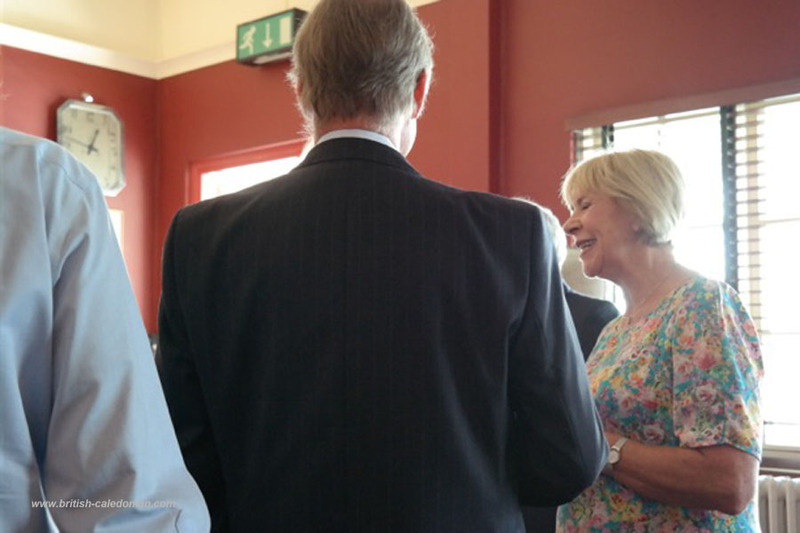 Mary is hoping that she can persuade Peter to attend the September bash in Crawley! On so many occasions when I was medically examined by Peter, he was to say “We want you to make old bones!” What he failed to say, was that the process of “Making Old Bones” is not necessarily an easy or straightforward one and in retirement actually is quite fraught with the frailties of advancing old age! I speak from personal experience, but I have to say, Peter was instrumental in keeping me flying all the way to retirement! He is a doctor who, if he didn’t know the answer himself (which was a rare occasion) he knew someone who did. 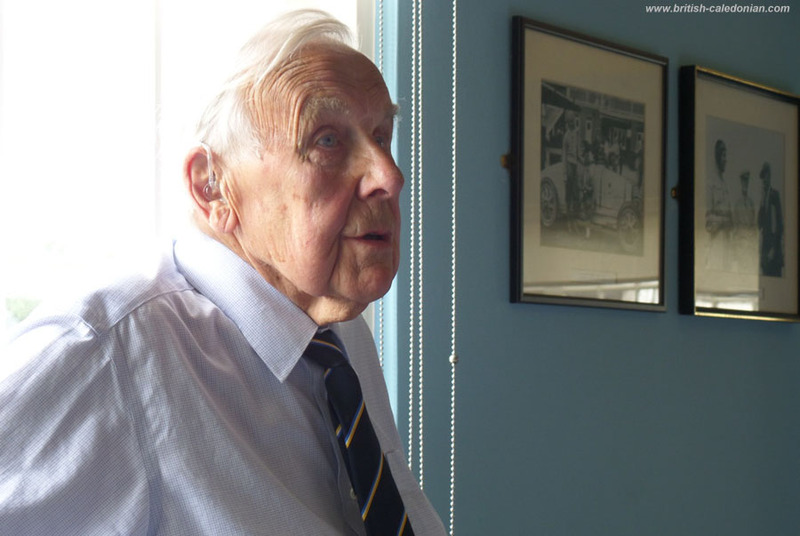 He ranks, for me, as one of the most outstanding influences and dedicated professionals in the business and he took on the might of bureaucracy in the field of aviation medicine. Over the full span of BCAL’s existence - and with BUA beforehand - Peter looked after the health care of staff at all levels. 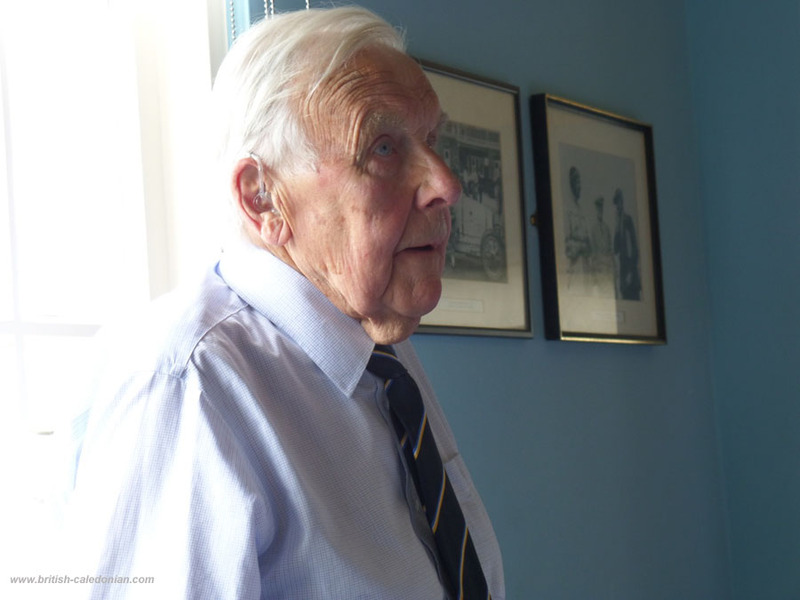 Especially, of course, he was responsible for essential aircrew medical requirements. Peter has continued to provide medical care and service to ex-BCAL people over many years since. 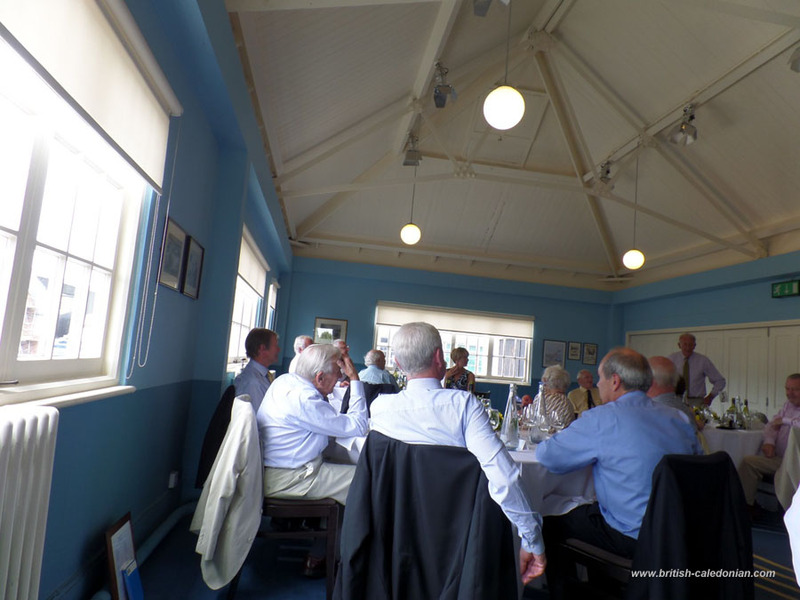 To thank Peter, recognise his immense contribution to BCAL and to aviation medicine, in general, Alastair Pugh organised a special lunch gathering in Peter's honour in the famous Bluebird Room at Brooklands Museum, Weybridge. 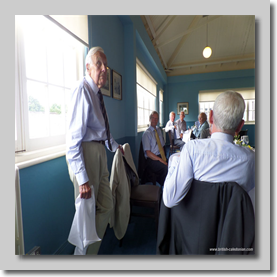 The lunch recognised Peter’s retirement from an outstanding career, and also marked his 91st birthday in summer 2014. Margaret Trett (Sir Adam Thomson’s former PA) co-ordinatinated arrangements.